TeslaTesla’s Model S was groundbreaking when it was released in 2012, but the competition is starting to catch up. Some Tesla fans and customers are speculating on what a redesigned version of the Model S might bring. They have converged on a few highly requested features: a redesigned interior, heads-up display, and a bigger battery. 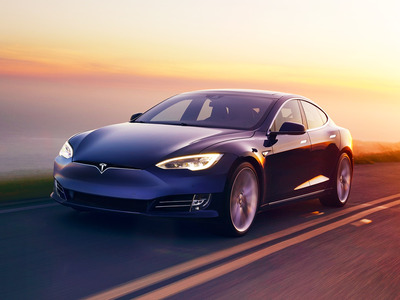 With the number of vehicles Tesla has on its plate, it may be a while before the company will refresh the Model S.
Tesla‘s Model S sedan made waves when it was released in 2012, becoming the first car without a combustion engine to win Motor Trend’s Car of the Year award. It was only the second car Tesla had produced, after the Roadster, and it helped demonstrate the demand for electric, luxury vehicles. Almost six years later, Tesla has released the Model X SUV and Model 3 mass-market sedan (which is in the midst of significant production problems) to rave reviews, and it seems like every other luxury car brand is preparing a Tesla competitor. Some Tesla fans and customers have taken this moment to speculate on what a redesigned version of the Model S might bring. In a Reddit thread titled, “Model S Refresh – what features are you expecting,” one user opened the discussion by asking other users what features a new version of the Model S would need to justify buying it over the Model 3, which starts at a little under half the $US74,500 base price for the Model S.
While those who participated in the thread had a variety of requests, they seemed to converge on a few features: a redesigned interior, heads-up display, and a bigger battery. Autotrader executive editor Brian Moody thought the new interior would be an essential feature, particularly the ability to customise colours, materials and textures “on par with what you might see in recent Porsches or Volvos,” he said in an interview with Business Insider. “That’s just a trend that we see across the board in almost any luxury space,” he said. While Tesla has been a leader among luxury brands when it comes to electric performance and technology, Moody said Tesla would have to respond to luxury competitors if it made a new Model S, as tech features like heads-up displays (which can show important information like the car’s speed and range on the front windshield) and the ability to integrate with Apple CarPlay and Android Auto have become standard for high-end vehicles. On top of that, Tesla may also want to improve some performance aspects to further separate the Model S from the Model 3, Moody said. “What luxury buyers don’t want is to have something where the less expensive car is … ‘nicer,'” Moody said. The Model S offers more range per charge than the Model 3 (up to 335 miles for the Model S and up to 310 miles for the Model 3), but the gap is smaller than a nearly $US40,000 price difference might justify. So there is a chance that a battery upgrade could be in store for the Model S.
While there’s speculation that a Model S upgrade could be coming as soon as the second quarter of 2018, there’s also a chance that Tesla fans will have to wait a while for a refresh. With the Semi, a rebooted Roadster, the long-rumoured Model Y SUV, and the Model 3’s production problems to work on, Tesla has more than enough on its plate.